Dr. Mark Sanders, Stephen F. Austin State University associate dean of the College and Liberal and Applied Arts, won the 2019 Western Heritage Award from the National Cowboy and Western Heritage Museum. 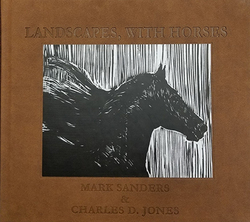 Sanders' book, "Landscapes, with Horses," was selected as this year's Outstanding Poetry Book Winner. NACOGDOCHES, Texas - Dr. Mark Sanders, Stephen F. Austin State University associate dean of the College and Liberal and Applied Arts, won the 2019 Western Heritage Award from the National Cowboy and Western Heritage Museum. Sanders' book, "Landscapes, with Horses," was selected as this year's Outstanding Poetry Book Winner. Annually, the National Cowboy and Western Heritage Museum celebrates creative works in literature, music, film and television that reflect the significant stories of the Western genre and inducts great westerners into its three Halls of Fame. Sanders' book is a personal reflection of his own life with horses, which he and his wife, Kimberly, have owned since 2002. "After our son died, we bought a horse to help channel our grief," Sanders said. "She was very wild, young and abused by her previous owner. She taught us much about survival, healing, patience, generosity and faith. We trained her and then bought additional horses." Sanders said the first poem in the collection, "Why We Bought a Horse," describes his and his wife's encounters with their horse. The poems all come from experiences with their small herd - from riding the high desert slopes of Idaho to the quiet times in their pasture. This is the second national book award Sanders has won in the past year. In December 2018, he received a Nebraska Book Award in Nonfiction/Biography for "The Weight of the Weather: Regarding the Poetry of Ted Kooser." Additionally, another book for which he was a primary consultant, "Nebraska Poetry: A Sesquicentennial Anthology, 1867-2017," won the Nebraska Book Award for an anthology. Since 2004, Sanders has been annually nominated for Pushcart Prizes, which recognize creative work - poems, fiction and non-fiction - published by small presses. "Landscapes, with Horses" also is nominated for a High Plans Book Award and a Midland Society of Authors Award. In July 2018, Sanders was honored by his Nebraska hometown with an induction into the Distinguished Alumni Hall of Fame. Ultimately, Sanders said he wants his poems to influence readers' lives in positive ways. He hopes winning the Western Heritage Award will allow his writing to reach places farther than the Plains and Northwest regions he comes from. "I had an unexpected letter from an individual in South Dakota who said that 'Landscapes, with Horses' really helped his wife in the aftermath of her father's death," Sanders said. "This was important for me to hear because I think good writing should always give something to the reader." Sanders has published more than 600 poems in journals in the United States, Canada, Great Britain and Australia. His creative prose - fiction and nonfiction - has been featured in top literary journals throughout the country. One of his short stories, originally published in Glimmer Train magazine, received an honorable mention by guest editor and well-known author Stephen King as one of the top 100 stories in the 2007 edition of "Best American Short Stories." Sanders said receiving the Western Heritage Award has meant a great deal to him because it puts his book in good company with other writers whose books he deeply admires. Past winners include Cormac McCarthy, Larry McMurtry, Frank Waters, Walt McDonald, Simon J. Ortiz, Barbara Kingsolver and A. B. Guthrie, among others. All winners of the Western Heritage Award receive a bronze sculpture of a cowboy on horseback, which is named "The Wrangler." The sculpture is created by Oklahoma artist Harold T. Holden, a 2017 Hall of Great Westerners inductee. This year's Western Heritage Awards event, which takes place in mid-April, will include the inductions of actors Kevin Costner and Howard Keel (posthumously), into the Hall of Great Western Performers. Singer/songwriter Michael Martin Murphey will receive a Lifetime Achievement Award for his contributions to music.